Heritage Park is a 122-acre tract of land near the East-West Connector, with trails adjoining the Silver Comet Trail. The Cobb Land Trust Inc. holds the conservation easement on this property which belongs to the citizens of Cobb County, Georgia. CLT was invited to assist Cobb County in planning and naming Heritage Park, which was developed as mitigation for the East-West Connector. Through an agreement with the Cobb County Dept. of Transportation, CLT requested proposals and interviewed design and engineering firms for the project. The board worked closely with the community, DOT, and the design firm to develop plans that would recognize the unique character of this area and make it accessible for passive recreation. The park includes a variety of historic and natural elements. The nearby Covered Bridge Historic District includes the Concord Covered Bridge, Ruff’s Mill, the Miller’s House and grounds, and several historic residential structures. 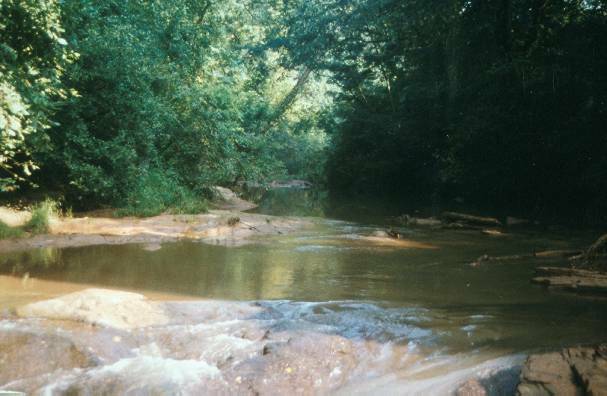 During the Civil War, the area was the site of the Battle of Ruff’s Mill on July 4, 1864. Inside the park, the ruins of the Concord Woolen Mills have been supported by Cobb County DOT with ghost framing to simulate the original structure and protect the remaining walls and windows. A trail winds through Heritage and passes the structure which was built near picturesque Nickajack Creek. CLT worked with Keep Cobb Beautiful on the Adopt-A-Trail program. Segments of 2/10ths of a mile are adopted by groups and individuals who pledge to care for them. CLT suggested adoption of the welcoming segment to The Georgia Native Plant Society (GNPS). GNPS adopted the first segment of the trail through Heritage in the Adopt-A-Trail program. The group was recognized with a national award for their efforts to develop a native plant area. The Keep America Beautiful organization awarded GNPS and Keep Cobb Beautiful second place in their 2002 national contest. GNPS has devoted a page of their own website to this project. The Cobb Land Trust Inc remains involved in stewardship of Heritage Park.